Fruit Leather Solid Sheet Ezidri Dehydrator Ultra / Snackmaker. Dimensions 32 cm wide. Central hole 8cm. I tried making fruit leathers/roll ups using baking paper before relenting and buying a few of these for my EziDri Snackmaker. I oil each sheet lightly with coconut oil before pouring on the fruit mixture. Once they're dehydrated, the fruit leathers peel off cleanly and easily and the sheets clean up easily too. Highly recommended. Ezidri Dehydrator Fruit Leather Sheet - Dehydrate your favourite soup, sauces or fruit purees using these solid Ezidry sheets which allow you to pour liquids onto the tray for dehydrating. The price is per pack of 2. Made of 100% food safe polypropylene. Please ensure you choose the right size for your machine. The standard sheets fit the Ezidri Snackmaker/Classic and are also compatible with Harvest Maid and Fowlers Vacola dehydrators. The Ultra sheet is larger and for the Ezidri Ultra dehydrator. 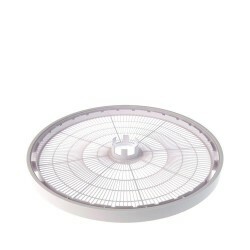 Tray - SingleAdd extra trays to increase the capacity of your dehydrator you can have up to 15.. Single tray. Add extra trays to increase the capacity of your dehydrator.You can have up to a ..
Ezidri mesh sheets are an excellent accessory to line your dehydrator trays. They help prevent food.. THIS LISTING IS FOR THE BASE UNIT ONLY. WHILST THE PHOTO SHOWS TRAYS THESE ARE NOT INCLUDED IN THI..
Spacer Ring - SingleThe spacer ring is exactly the height of a tray (being a tray with the centre..
Natural bristle wax brush / pastry brushNatural bristle brush which can be used as to apply wax ..